This 2-day class Participants are guided in the best usage approaches for parametric design philosophy through a hands-on, practice-intensive curriculum. Participants acquire the knowledge needed to complete the process of designing models from conceptual sketching, through to solid modeling, assembly design, and drawing production. Schedule of upcoming Inventor training classes. Students need to be experienced with the Windows operating system and a background in drafting of 3D parts is recommended. A working knowledge of basic design/drafting procedures and terminology is highly suggested. 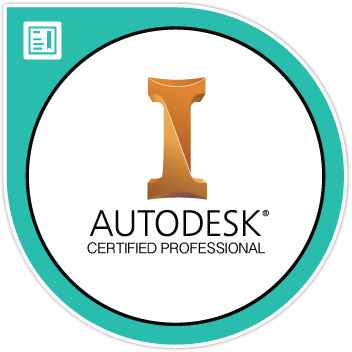 The Autodesk Inventor Certified Professional badge validates professional users’ advanced knowledge of the tools, features, and common tasks of Inventor. Earners of this designation have demonstrated knowledge of advanced modeling, assembly modeling, creating a weldment, and more using Inventor.